GM Susanto Megaranto is leading the Indonesian charge with a large troupe of fellow countrymen FM Wahono Awam, WIM Irene Kharisma, FM Novita Anjas, FM Simanjuntak Sebastian, Ferdiman Tersiman, Kadek Lin Dwijayanti, Hutapea Juniel, Nardi Chairil and IM Irwanto Sadikin. WIM Irene Kharisma especially is set to follow his footstep to be amongst the top rungs with one WGM norm to her credit so far. FM Lim Yee Weng is currently the only Malaysian with full points from two games. 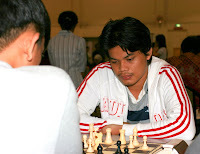 His next mission is to deny the Kalimantan IM Irwanto Sadikin into the top league in Round 3.